How many homes/lots are there in Florentine Estates? There are 449 lots within Floretine Estates. There are currently only two vacant lots for sale. Are the properties individually owned? Yes, homeowners own their lots and an equal share of the collective common properties. Yes, Florentine Estates has a Home owners association. What are the monthly HOA dues, and what services do they cover? The monthly dues for the fiscal year 2018/2019 are $112.00, and is billed quarterly ($336.00). The dues cover upkeep and maintenance of all common areas; and all services and financial obligations required to maintain Florentine Estates as a premier senior residential community. Garbage and recycling are also included in the monthly dues. Is Florentine Estates within the city limits of Florence, with access to city services? 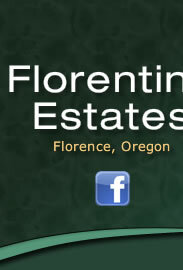 Yes, Florentine Estates is within the the city limits and has all city services. What age restrictions are there for Florentine Estates property ownership? Florentine Estates is a 55 & over community. At least one person residing in the home must be over 55 years of age. No lot shall be occupied on a permanent basis by any individual under age 18. Is there available RV/boat/trailer storage within Florentine Estates? How can I find more information about available properties in Florentine Estates? Contact your realtor for information or click the link below for a listing of local Florence realtors. Since Florentine Estates is a private gated community we do not allow individuals to tour our community without an realtor.